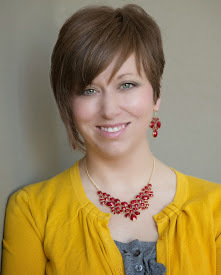 yarn craftiness round up with Hi! It's Jilly! because we are dreaming of warm weather. just in time for Easter. Barely. Yarn. It's not just for sweaters anymore. 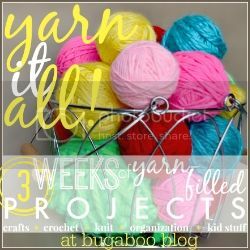 fun and unique uses for yarn! Call Her Happy - Makes ME Happy! And YOU! You know no yarn series would be complete without a yarn wreath! Come on, I'm the wreath lady, right? I've had this idea in my head for a few years now and never got it done before Easter, like that would surprise you. This year I just barely busted it out and got it on the door in time. Phew. 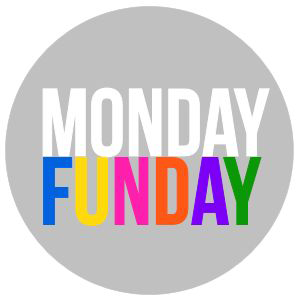 It was supposed to go up yesterday - oops - so you have one less day to make it yourself, sorry. You can always make it next year! Apparently I really like taking random food items and turning them into sunbursts. Candy corn anyone? First, let's focus on the carrots. They are so easy and you probably have everything you need at home already. 1. Take a piece of card stock and lay it diagonally in front of you. 2. Take the corner and begin rolling it, making sure to keep one end skinny and one end wider. 3. Continue to roll it up across the paper, you'll begin to kind of curve a little. 4. Stop rolling when the opposite corner is just barely sticking out. 5. Put hot glue on the corner. 6. Roll that corner up and hold it for a second. 7. And you have a stiff paper cone! 8. The cone will have a point or two on the top from the other corners. Just leave these there. 9. Repeat about a million times. 10. Put hot glue on the point of the cone and around the point. 11. Leaving a little tail, take your orange yarn and place it across the point, then wind it around the point over the hot glue to hide the opening. 12. Hold the little tail down against the cone. 13. Start winding the yarn around the point of the cone, over the tail. 14. Continue winding the yarn around the cone, working your way to the other end. 15. When you reach the straight edge of the opposite end, stop. 16. Put a little bit of hot glue on the inside of the cone and push your yarn down. 17. Snip off the yarn. 18. 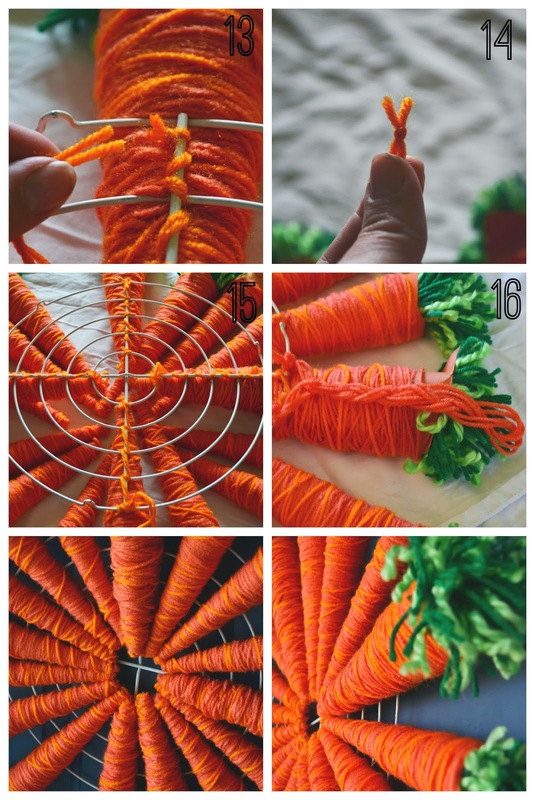 This part is optional, but you can use a different orange yarn and wrap it sporadically around the carrot, not covering the whole thing, just adding a little detail. 19. Repeat this like a million times. A note about winding your yarn: I didn't do this all sleek and smooth like. I just quickly wrapped the yarn around and however it landed it stayed that way. The only requirement is that you pretty much cover up the paper - but even if there are spots showing the paper orange, so it's ok! 20. 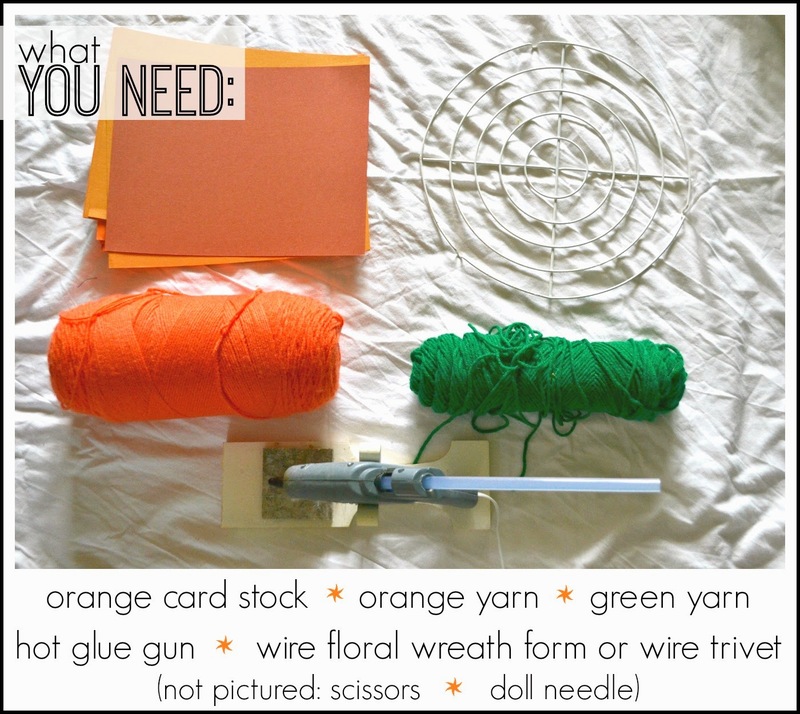 Make a bunch of pom pons with your green yarn. I used two greens for added interest. I also used the easy version of pom pom making - kind of like this, but not with a fork. If you want to do the "real way" you can use my tutorial here. 21. Spread a bunch of hot glue around on the inside of the top of the cone. 22. Fold your pom pom in half. 23. Stick it down in the cone with the folded part down. Make sure it is sticking to the sides. 24. You can bend the pointy parts of the paper down if you would like. 25. Trim off the long strands from the pom pom, and any other yarn that looks too long. 26. And repeat a million times. So you've got some yarn carrots! Cute! After I made them into a wreath, I wished I'd made more to just put in a basket for decor inside. Let's make us a wreath! 1. Cut a loooong piece of yarn, thread your doll needle, fold the yarn in half and tie the ends in a knot. 2. 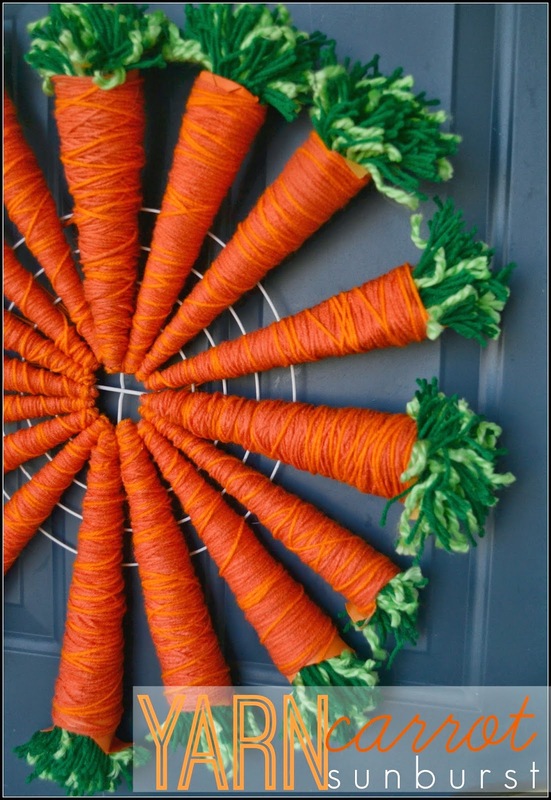 Lay your carrots down (right side facing down) and lay your wire wreath form or wire trivet on top. Lay four carrots first, cutting the circle in fourths essentially. 3. Continue to fill your carrots in, getting an idea of the layout. 4. 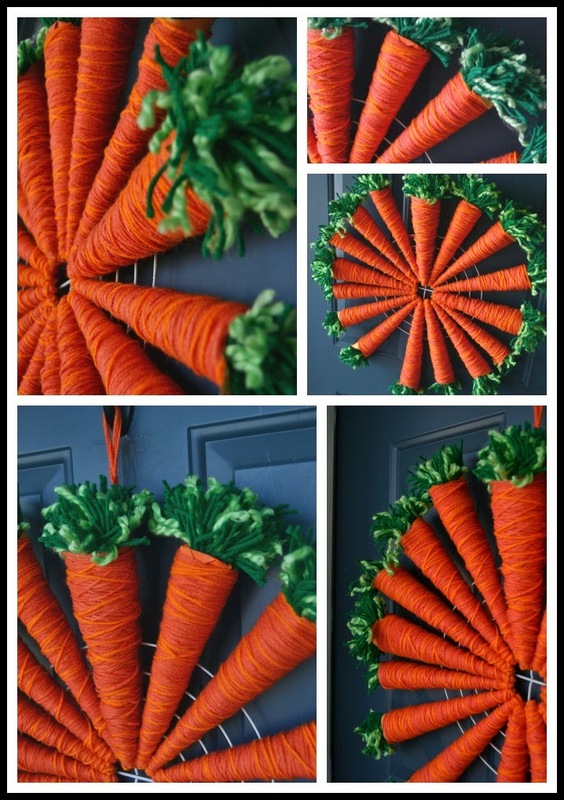 Once you know how you want your carrots, you can begin sewing them to the wreath form. Tie your yarn onto the form near the center. Make sure to leave the VERY middle free, since this will be seen from the front. 6. Move up to the next wire and do the same thing, wrapping the yarn, pulling the needle through the yarn on the carrot and pulling tightly. 7. 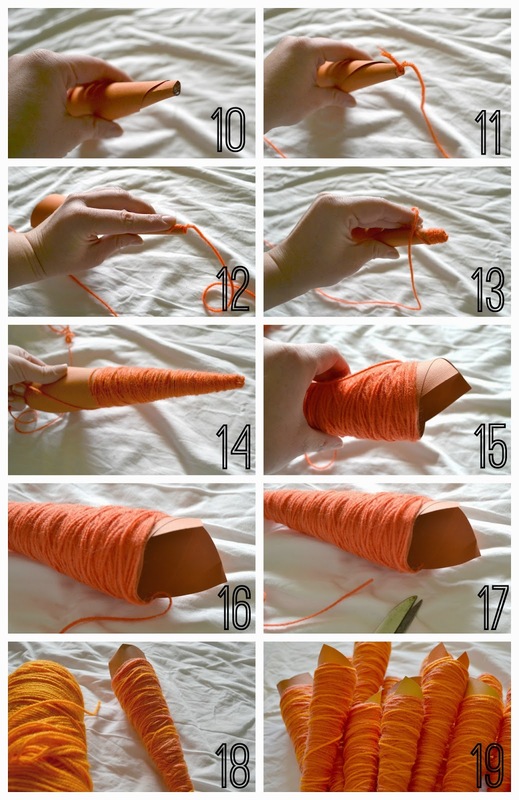 Continue to make stitches around the wire and through the yarn on the carrot. 8. Go all the way up the wreath form until you are at the outer circle. 10. pull the needle through and pull the yarn until there is a little loop. 11. Then stick your needle back through the loop and pull it tightly, thus making a knot. 12. 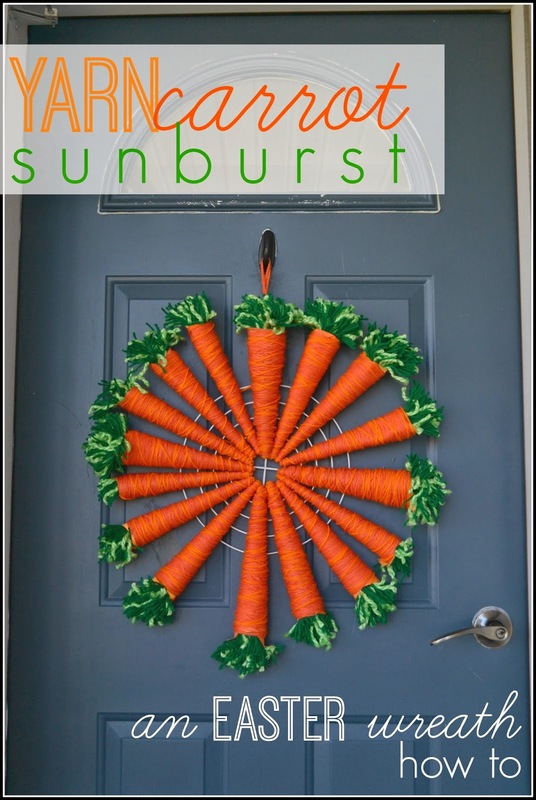 See, your carrot is nice and secure to the wreath form! 13. 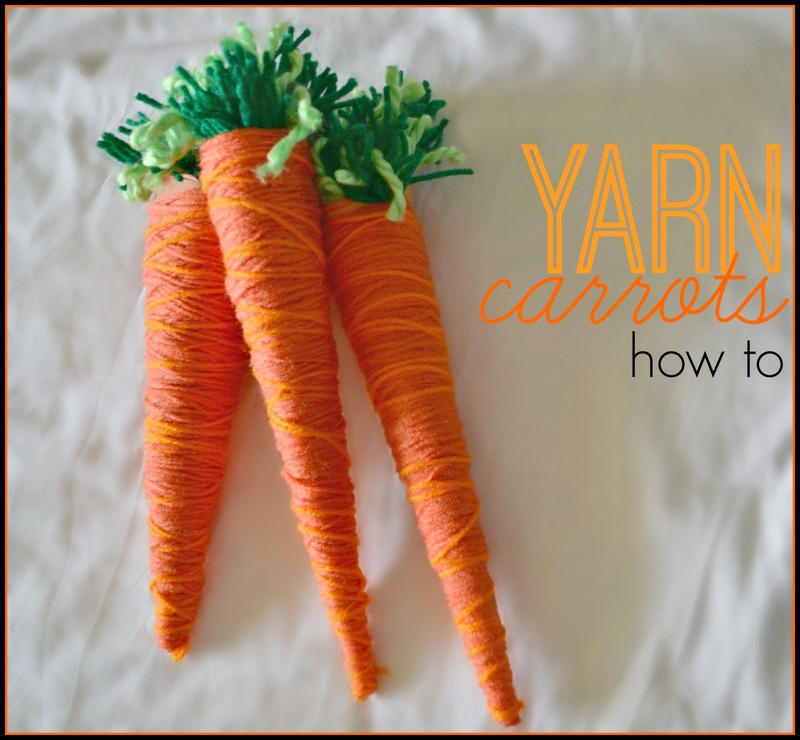 Now you can snip off the yarn at the knot and move onto the next carrot. 14. Just tie the ends in a new knot. 15. I sewed my four centered carrots first. Then I went back around to do the other carrots that filled in the sunburst. 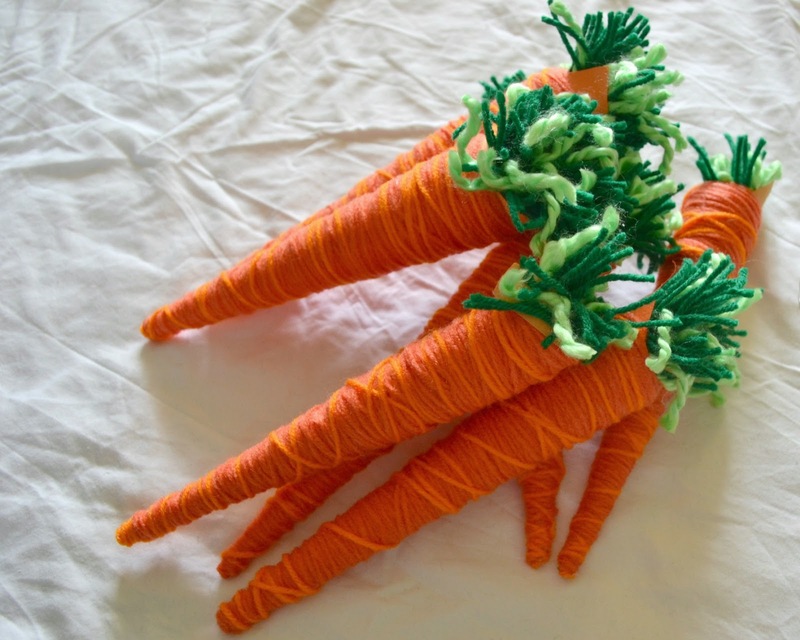 When I did those carrots, I didn't snip the yarn at the knot, rather I just kept one continuous piece of yarn and just moved from the top of one carrot to the bottom of the next carrot. The carrots are close enough together that you can't see the long pieces of yarn from the front. 16. Cut a long piece of yarn and attach it to the top of the wreath somehow. I braided it first, then tied the ends of the braid to the wreath form. I hung it from the top loop in the braid. So, the metal wreath form I used was actually a wire trivet I got at the thrift store a while ago. I spray painted it white before I used it. 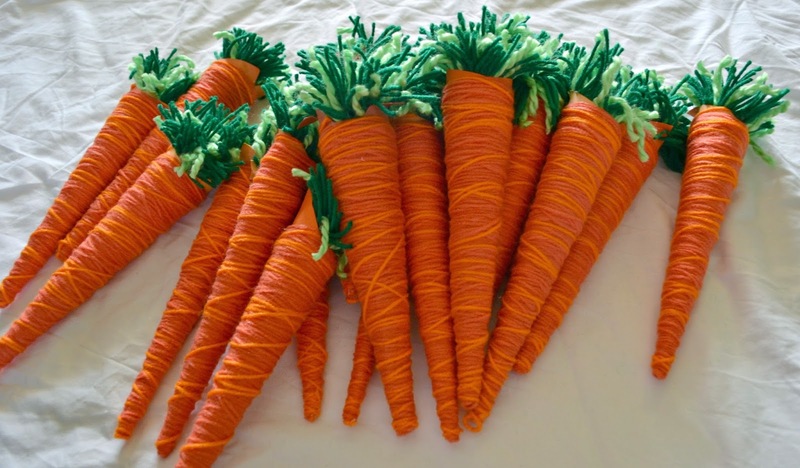 Those yarn carrots are perfect! 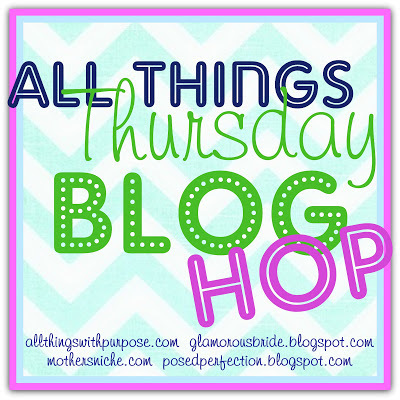 Thanks for linking up to Inspire Us Thursday on The Inspired Wren.